BoardGaming.com> Games> Board Games> Flick ’em Up! Split up into two clans and prepare to face your rivals in the purest of Western traditions! Discover 10 scenarios that will immerse you in the great rivalry between a sheriff and a bunch of bandits. Build typical Wild West towns that you will pass through on your journey. *Easy to learn and very fun to master. *Comes with 10 scenarios, each adding nice degrees of variation to games without ever overcomplicating the rules. *Varnished components ensure a great deal of control when it comes to flicking pieces across the board, making each minor victory satisfying. *Ideal for tables 3’X3′ or larger! Any smaller and you might have some space issues! 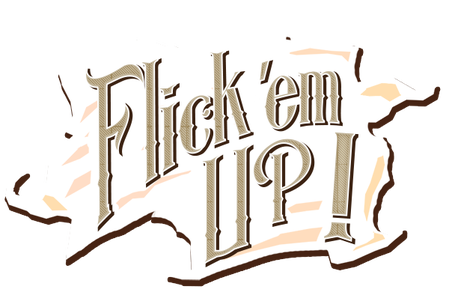 A wordy opinion: Flick ‘em Up! 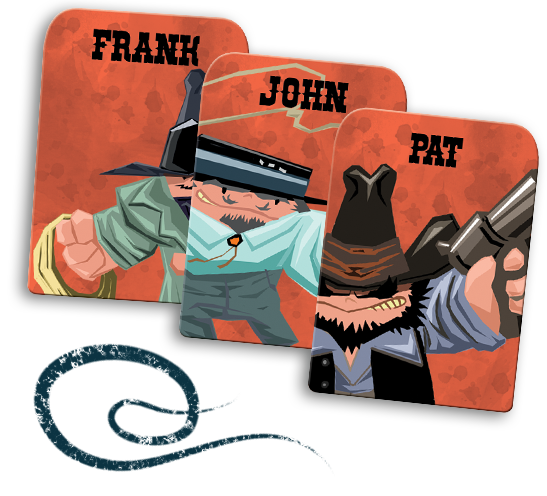 has you and up to 9 others causing shootouts and mass panic in spaghetti western towns across America as one half take on the role of lawmen trying to prevent the other half playing as outlaws completing some dastardly schemes ranging from poisoning water to committing robberies. There’s no tying people to train tracks, though, so…not off to a perfect start, but bear with it. There may be no classic train based calamity committed to jaunty piano tracks through black and white filters, but Flick ‘em Up’s components manage to fill the hole the lack of nostalgia leaves. 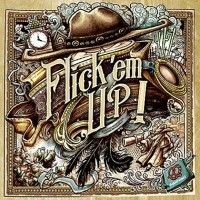 Flick ‘em Up! automatically stands out with its buildings that pop up high, the towns that invade the table and slick wooden components make it an eye catching wonder, and that’s before anyone even starts thwacking each other. Before the game begins, cowboys divide themselves up into groups, half becoming the good, half becoming the bad and a varied amount becoming the ugly dependent on who’s playing. Once everyone has assigned themselves a lawman or a member of the corrupt Cooper Clan, player’s go about causing raucous nonsense across the town. It seems disrespectful to dismiss these town slaughters as silly calamity, but I can’t help it. The way you go about resolving these battles is so darn daft it’ll have you all in hysterics. On their turn a cowboy can do two major actions. If they want to move, they replace their cowboy with a movement disc and flick it across the table. If it hits anything, then the movement is considered void and the cowboy returns to where they started. If however, it remains unscathed, the cowboy takes up their new position in the discs space. Alternatively, they can shoot, attempting to tear some holes through the opposition. Here they place a small grey disc on either side of their cowboy and flick it (preferably) at someone they don’t like the look of. If it misses, nothing happens. If it taps an enemy, it’s only considered to have grazed them and does nothing. However, if it knocks your opponent over, then the shot is considered a hit and the unfortunate recipient of the bullet loses 1 hit point. That’s pretty much all you need to know. I mean, there is the tiny issue of how to win, but I can’t honestly tell you how to do that, as that’s determined by what scenario you choose to pick. Pick ‘em Up comes with a bulky scenario booklet, with 10 different seems consisting of alternative objectives, towns and rules and component additions. The rules of Flick ‘em Up! remain simple throughout, but what I really like about the scenario booklet is the fact that each scenario’s tiny rule additions and tiny gameplay additions never overcomplicate the original formula you’re given, and you can approach these scenarios at your own pace. The same can be said with the objectives of each scenario. They add great degrees of variation without rewriting the entire rulebook. Some scenarios see outlaws running into the buildings surrounding them and attempting to nab all the gold within them whilst lawmen follow them in to have tiny duels within. Others see factions attempting to lead hostages out of enemy territory. It’s like the designers played the Mexican Mission map in TimeSplitters 2 on all the different game modes and just said ‘Yeah, let’s make a board game out of this.’ Coincidentally, if that is your design philosophy, then more power to you my friends. As the game doesn’t come with any board, and each of its towns must be constructed according to the scenario you play. As such, your table becomes the playing area. Our 3’X3’ coffee table just about manages to do the job. It’s a bit of a squeeze, but the whole game is easily playable. It does become an issue if you have to engage in duels, mini bullet flinging contests that require their own dedicated space to resolve…and we don’t really have the space to sacrifice. If your table is as petit as ours, you might need to do what we do and grab a smaller table or even simply use the lid of the box for duels. 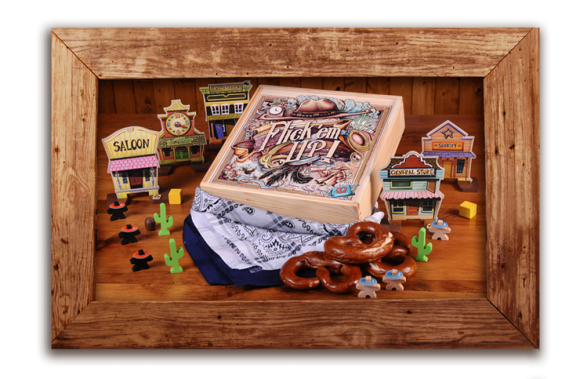 Simple to learn, remarkably fun and a guaranteed laugh riot for anyone who lays eyes on it, Flick ‘em Up is not only a brilliantly fun game, but a rather handy toolbox. Once you’re finished with the scenarios on offer, if you don’t feel like replaying them, you can simply make your own. Still, there doesn’t seem to be any room for a train expansion of any kind…unless I grab my copy of Colt Express. Add a Review for "Flick ’em Up!"